Every morning I wake up with the very best intentions of eating right the entire day, because I have really seen the effects of what food does to my overall energy levels (I wrote several blog posts a year ago all about my Health Quest journey that you can read about here), but, let’s be honest, some days I just don’t do that well. One of my errands might take a lot longer than I expected, or I forget that we have soccer pictures after practice and all a sudden I’m left in a pinch and having to pick up fast food. 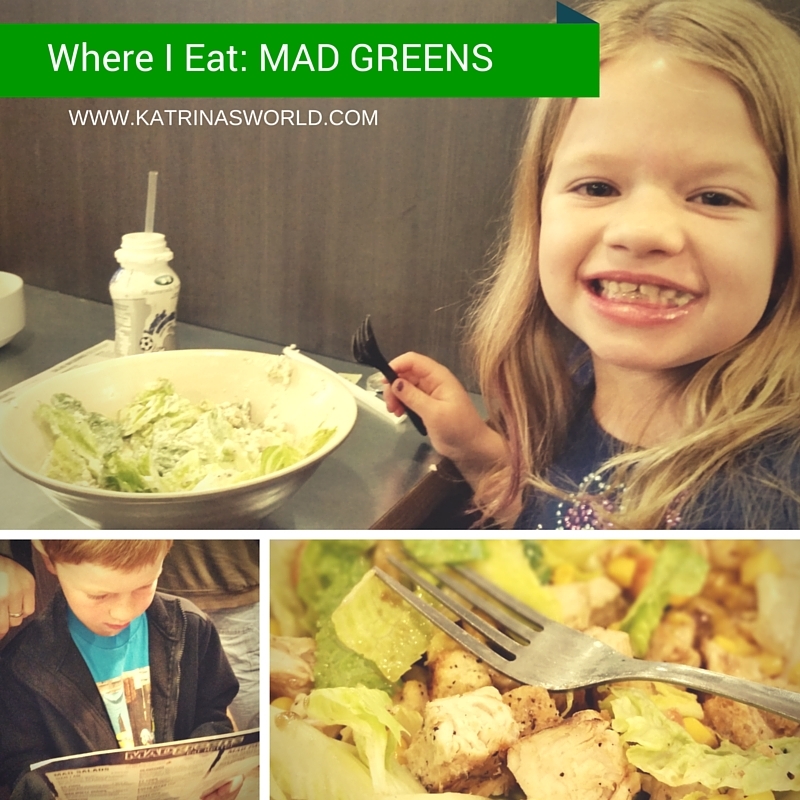 It’s nice when there is a place you can go that has very fresh and healthy options not only for adults, but for kids as well – hello MAD Greens! I love this place – the entire restaurant is full of amazingly healthy, fresh food that your whole family will love! Everything MAD Greens prepares, from salad dressings to bread, is made in-house from scratch with the freshest ingredients, and you can taste it! MAD Greens serves salads, wraps, soups, paninis, and juice combinations, and their salads are very interesting to say the least! I’ve tried several and love their Ty Cobb salad the most – full of flavorful crisp ingredients and I’m very partial to their hand-crafted Ranch dressing. So yummy! I like any excuse to go to MAD Greens and with their new location in Castle Rock, CO, its very close to me! Last weekend I took the whole family to the Castle Rock, Colorado location of MAD Greens to enjoy dinner and it was excellent! I have three kids and my two oldest were very excited to eat salad – and I’m not kidding! They love salad and one of the choices on the kid’s menu is a mini salad, where they got to pick their own salad ingredients and they were very happy about this! They each made a unique salad and once they picked their hand-crafted salad dressing they were set. I love seeing my kids enjoy healthy food! My youngest son chose to have mac n’ cheese and was very pleased about this – I’m still working on him – he’s not a big fan of ‘green stuff’ yet. :) The kid’s meals also come with a homemade cookie, and drink. Of course, my youngest said the cookie (which was gigantic) was the best part. My daughter said her favorite thing was the salad and the feta cheese and my oldest son really liked the homemade balsamic vinaigrette salad dressing. To each their own, right? Honestly, I’m just really happy that my kids are willing to try new things, especially very healthy things, and that they like them. Now if we can only get my youngest son to enjoy the ‘green stuff’ as much as his siblings…he’s a work in progress! My husband, got a wrap and loved picking out each individual ingredient that went inside it. He said it was delicious, and he also decided to try their Strawberry Cooler Juice, which was really refreshing – in fact, we all tasted it. I think my youngest could have had the whole thing if we would have let him! 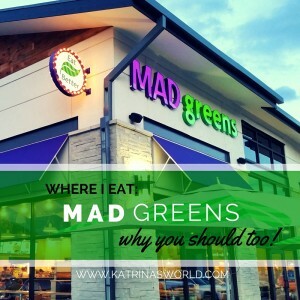 We enjoyed our experience and would highly recommend trying MAD Greens! Besides being a genuinely healthy option for your whole family, I love knowing that MAD Greens is committed to their food and the communities they are located in by using produce from local farmers, and they strive to use organic ingredients whenever possible. For me, I find that very exciting knowing that the meal I’m about to eat is from the farm down the road! Plus, I live in community that has a small-town feel, and we all love to support our community by shopping local – what could be better than enjoying a fresh meal of superb healthy ingredients that came from my neighbor? I just love it and am so impressed by this business model. Check out MAD Greens and go enjoy a healthy salad! Currently they have locations in Colorado, Arizona and Texas. Comment below and tell me who you would take to enjoy a meal at MAD Greens and why? Then share this giveaway on your Facebook page and encourage your friends to enter. If you have not done so already, LIKE my Katrina’s World Facebook page. Winner will be picked randomly on April 15th and notified via email. Winner must supply their address for shipment. 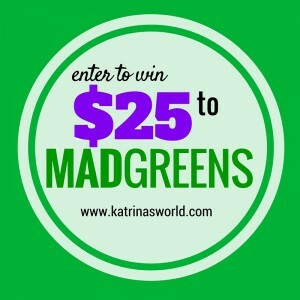 Thank you to MAD Greens for sponsoring this giveaway. Visit MAD Greens on their Facebook page - or on Twitter or Instagram. Thanks for reading! Hope you enjoy your meal as much as we did! I can’t wait to go back!